The emerald ash borer is here. The tiny insect, native to China, was discovered on Brookfield’s southwest side in March. The news was bad … but inevitable. Ash trees are plentiful across Brookfield, Elm Grove and New Berlin, WI. All are threatened by the invasive pest, which has killed millions of trees since arriving in the U.S. in the past two decades. Tree experts, such as GMS’s partner Hoppe Tree Service, believe that every ash tree in these communities could be attacked in the next two years. Proven preventive treatments are available – contact GMS if you’d like to learn more. The problem is, no one knows exactly how far the emerald ash borer (EAB) has spread locally. It’s been found in almost every eastern Waukesha County community. How do you know if trees in your yard are infested? The key tipoff is dieback at the crown of the tree, according to Hoppe Tree Service. EAB larvae, which feed on the insides of ash trees, start up high. Branches die. Leaves disappear, or become thin and discolored. Suddenly, light shines through what was once a thick, lush canopy. Increased woodpecker activity is another symptom. 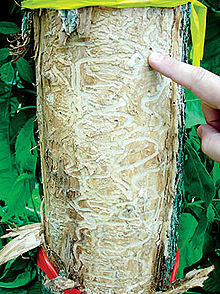 Woodpeckers feed on EAB larvae. If many are present, the woodpecker damage to a tree can be so severe that it will look like strips of bark have been peeled away. The conclusive sign is finding S-shaped patterns beneath an ash tree’s bark (see image below). EAB larvae create trails in wood as they feed. However, this telltale symptom is usually hidden by bark. If you recognize other signs of potential EAB infestation, pulling back bark in a tree’s upper level could provide a definitive answer. Obviously, suspecting (or confirming) that a tree has EAB is disturbing. Yet, all is not lost. An infested tree might still be saved, depending on how far the EAB larvae have gone into it. As your landscaping and lawn services partner, GMS will always offer every option to keep your yard and greenery healthy. Our final post in this series will explain the choices with trees suffering EAB attack. In a way, the situation resembles dealing with an ailing pet. Sometimes they can be kept alive; other times, we have to let go. The decision might be obvious … but rarely is easy.